As your child grows older they will eventually move on from liquid to solid foods. Buying pre-processed baby food can be really costly over time, so one of the best alternatives that you have available is making your own. Baby food makers simplify this by processing solid foods into a puree. 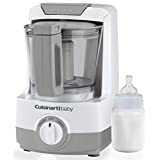 There are many types of baby food makers to choose from, including immersion blenders, hand crank food-mills, and all-in-one blenders. The biggest advantage of these best processor for baby food is that they save money over the long term since you buy all your own ingredients. All-in-one blenders come with steaming and blending capabilities, allowing you to sterilize, cook and puree food at the same time. You will want to find a machine with a great puree quality, meaning that the more blended it is, the better. Ease of use encompasses easy-to-clean parts, simple operation, and intuitive design. The good thing about immersion blender style devices is that they have other, more versatile uses after your baby has outgrown pureed foods. Compact size is important too, given that many consumers have limited space on their countertop and storage space. Look for baby food makers that use durable parts, ensuring that they last a long time as your infant grows. This unique and multi-functional appliance from Beaba assists you in making healthier and more fulfilling baby food. In just 15 minutes or less, you can steam fruits, veggies, and meats. After that, you blend it straight into a puree. In addition to these 2 key functions, it also comes with a warmer and defroster, making it one of the most versatile appliances on your countertop. It is easy to clean, and you can blend foods to your desired consistency. Made up of durable plastics and metals, this baby food maker is solid and built to last. Baby Brezza’s single brown design ensures that you don’t have to transfer hot foods to and from the blender as you’re making it. It also means that it is easier to clean since it is BPA/phthalate free and dishwasher safe. The all-in-one blending and steaming gives you the ability to just add chunked up ingredients, set the steaming time and let it go. If you’re interested in an inexpensive food mill option that just blends and purees fresh foods, check out this model from KidCo. It trades off the all-in-one heating capabilities for compact size and cheaper price tag. The blending bowl is dishwasher safe, and the blending feature makes it easier than ever to prepare homemade baby food. Along with the food processor, it comes with 2 cup-sized bowls, sample recipes, and a non-skid bowl. For consumers looking for something more high-end with a greater blending capacity, check out this product from Beaba. It is specifically designed with busy parents in mind, with its patented built-in steam heating system, auto shut-off feature and easy clip system built for one-handed use. Its most unique feature is its dual bowl preparation, allowing you to effectively blend twice as much compared to standard models. Turning solid fruits, vegetables and meats into purees take under 15 minutes. If your life is exceedingly busy and you’re searching for a multi-functional device that covers your needs, Cuisinart’s model is impressive. On one end, it can steam and chop/puree foods as any standard model can. However, it also comes with a bottle warmer, making it the perfect accompaniment for preparing full meals for your infant. The bowl is sealed to prevent spills and to improve steaming with less loss of heat. Included in the package is a recipe booklet, bottle adapter ring, measuring cup and spatula. Holding one of the largest blending capacities on the market, this processor from Babymoov delivers consistent value at a reasonable price. It features 5 main functions right out of the box, including warming bottles/jars, sterilizing, steaming, defrosting and blending. The fully automatic functions and the intuitive control panel is simple to use. The one bowl design guarantees less food wastage and keeps you safe from transferring hot foods back and forth. 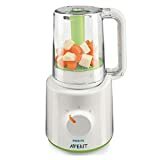 Designed with over 20 years of experience, this food processor from Beaba is excellent for preparing larger batches of baby food. The multi-purpose mixing blades ensure that the final product will have the right texture, and the timer gives you an alert when the meal is ready. The bowl features a capacity of 4.6 cups or 1.1 liters. The auto shut off feature ensures your safety from overheating or burning foods, while the removable power cord makes it simpler for storage around your cupboards. If you know about the Magic Bullet, then this variant from Baby Bullet is similar in performance and economical price. When you make baby food with this product, you will be guaranteed to save time and money compared to store-bought, processed baby food brands. One of the key advantages of this model is that it allows you to safely separate and prepare foods for different appliances. The pureeing function leaves it totally smooth without any visible chunks, making it quite effective. 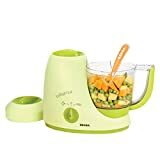 With an attractive white and green color and style, this super compact combination blender/steamer is excellent for making baby food. 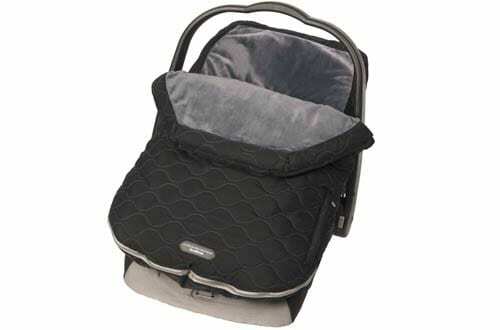 It has 800 grams max capacity for solid foods and 450 mL of liquids. It has a very compact design, and the attached handle on the blender makes it very convenient to pour afterward. Included accessories include a spatula, measuring cup and a recipe booklet. The safety lock on the lid ensures that hot food doesn’t spill out. If you’re interested in an all-in-one food processor that is specifically designed for baby food, check out this model from Babymoov. It comes in cherry and green styles, and the 5 in 1 functions makes it super versatile. It can blend, warm, sterilize, steam and defrost. Just hit the button and the 100% automatic operation, making it simple to use. Steaming has many advantages over pre-processed food, as it will preserve more nutrients from the natural ingredients.